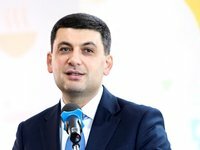 Ukrainian Prime Minister Volodymyr Groysman says he is confident that everything will be fine in the country, regardless of who wins the presidential elections. "We need to look at the authority of each institution and draw conclusions from this. I would not like to comment on any rumors, speculations. Ukraine will be fine," the prime minister told reporters in Kyiv on Thursday while answering a question about a possible collapse in the country in case of showman Volodymyr Zelensky wins the presidential race in Ukraine. The second round of the presidential elections where Zelensky will compete with incumbent President Petro Poroshenko, is scheduled for April 21.